The Cyprus Interaction Lab was approached by the Youth Board of Cyprus to organise and facilitate an activity aiming to rethink the online counseling service it currently offers to young people. 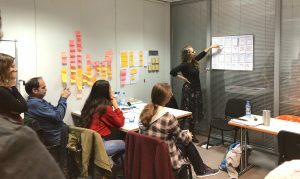 CIL, having implemented various adaptations of Google Ventures’ inspired Design Sprint in the past, adjusted the method to an one-day sprint that took 3 multidisciplinary teams of young creatives through understanding the problem to proposing solutions. The workshop took place at the Cyprus University of Technology on Friday 23rd of November 2018. The teams consisted of students and young professionals from multimedia and graphic arts, business, advertising, engineering and psychology/social work backgrounds. During the workshop, participants discussed, explored, proposed solutions and developed prototypes (applications, systems, etc.) with a goal of making sure help is provided to those that are looking to talk to a professional in the most user friendly and inclusive manner. The interactive workshop was hosted by Prof. Panayiotis Zaphiris and Andreas Papallas from the Cyprus Interaction Lab. The event was supported by the Research center on Interactive media, Smart systems and Emerging technologies (RISE, http://rise.org.cy).